Looking for a special Valentine’s Day activity or craft for your children to make or for you to make together? Look no further—we’ve compiled a variety of gift ideas through images we’ve pinned to our SchoolFamily.com Pinterest page. They’re just right for your child’s classmates, teacher, or that very special someone. Best of all, only a few of them contain sugar! While many schools have banned the exchange of sugary Valentine’s Day treats, giving out candy-free cards and small gifts is typically acceptable in schools (best to double-check with your child’s school, however). Just be sure there are no hurt feelings by insisting that your child create a Valentine for each child in her class—or, have her plan to exchange Valentines with select friends outside of school. Since we’ve already established that Valentine’s gifts for the class must include every student, these crafts, while simple, will take your child a bit longer to create. When I did these types of Valentine’s gifts with my children, I’d plan ahead and have them do a few each night. That way, the kids wouldn’t get tired and bored, yet the gifts would get finished without me making them all at the 11th hour! How about custom-made Friendship Bracelets for everyone in the class? These are simple to make, differentiated for girls and boys (to compensate for the boys’ potential yuck factor—“Ick, a bracelet?”), and personalized. You and your child can create your own hand-written verse, written or printed on small cut-out cards (how about heart-shaped? ), or you can download the blogger’s pdf template with the verse, “Our class would knot be the same without you.” Braid some brightly colored string (or save time by using single strands of colored ribbon), and weave them through the cut-out cards. Have your child sign each one, i.e. “From Jonathan,” and you’re done. These are sure to be a real crowd pleaser. Valentine’s Day Crayon Cards might be one the most clever crafts I’ve seen in some time. When my kids were little, I always seemed to have broken crayons lying around, and I’d find them in the weirdest places—under the baseboard in my kitchen, under my kids’ beds, under our baseboard-heating units, in planters—you name it. And that’s not counting the mashed up broken crayons pieces at the bottom of our crayon container. Well this craft activity finally finds a good use for them. Read the directions for this simple project: dice up the crayons/pieces; bake them in heart-shaped molds (! ); attach them to small decorated cards, and your child has beautiful, colorful, personalized Valentines for the whole class. If you’re never made (or seen) one of these Candy Bar Poem cards, you’re in for a treat. Depending on your child’s age, he can create most of this gift by himself, writing the words and then gluing the wrapped candy bars in the right places (you might need to watch and be sure he leaves enough room for the size of each candy bar). 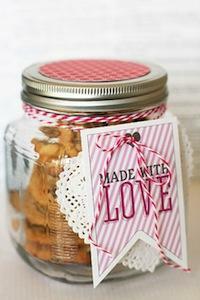 Another adorable (and tasty) teacher gift is this wide-mouthed jar filled with homemade cookies. It’s easy to make and carries a personal message when you attach a gift tag created by your child (or save the step and download pretty tags from this template. Use a heart-shaped hole punch to make a hole at the top of the tag, and attach the note to the jar with brightly colored string or ribbon and Voila! you’ve got a lovely gift for your child’s teacher. If your child’s teacher is known to have a sweet tooth, this easy-to-make gumball or candy-dispensing machine is for you. Created by painting and decorating an inverted small or large clay pot and matching saucer, this little machine will get a workout on the desk of your child’s teacher. Anxious to avoid the commercialism of the day? Make this Valentine's Day craft with your child and feed the birds at the same time. This activity takes more time and requires a few days for the finished product to be complete, but once done, you and your child can hang these heart-shaped treats made of birdseed on branches throughout your yard. Perhaps you could obtain permission for your child to bring some to school to hang on branches outside student classrooms? Read the clearly written (and super easy) directions and have fun! Let’s face it: For many of us it just isn’t Valentine’s Day without receiving—or giving— something chocolate. To satisfy that craving, we have a variety of sweet Valentine’s treats. How about Conversation Hearts on a stick, made of red velvet chocolate cake; Outrageous Chocolate Cookies; Cookie Kisses made with heart-shaped Dove chocolate treats instead of chocolate kisses; and Cake Pops, easy to make using chocolate cake mix, to name a few. If chocolate’s not your thing, how about some Raspberry Cream Cheese Heart Tarts? Not into sweets at all? Okay, place your Valentine’s Day order in advance so your kids can make you this Valentine’s Day Egg in a Basket for breakfast! Strawberry Marshmallow Fruit Dip will have your child eating fruits and getting protein and other nutrients from reduced fat cream cheese and fat-free Greek yogurt. (Okay, there’s also marshmallow crème, which isn’t especially nutritious, but it’s for Valentine’s Day, after all). Go wild with heart-shaped fruits and veggies, served on popsicle sticks, along with fat-free or lowfat dip. Or this healthy Sweetie-Tweetie sandwich. For breakfast, stir things up by making this heart-shaped hard-boiled egg! What other crafts are you making with your kids for Valentine's Day? Share your Pinteresting activities below in the comments!